It’s that time of the year where we celebrate our joys and look forward to the new year. For some, it’s the time to flock to shops and online stores in search of the perfect gift. If that’s you, United Way of Greater Los Angeles has done some of your shopping legwork already. We’ve compiled a list of gifts that will make your loved ones smile and support your neighbors in need. Each item listed below contributes to a service or organization that supports some of our most vulnerable neighbors in Los Angeles County. We picked our favorite items, but there are tons of gifts to choose from, so take a look through these special stores and see what speaks to you. If you need a post-shopping pick me up, we’ve also included a list of local charitable cafes and restaurants. This lovely key necklace comes in gold and silver and can be customized to say “love”, “believe” or “dream”. You choose the message and give it to someone who needs it. Proceeds from your gift will help employ of one of our neighbors who is transitioning out of homelessness. 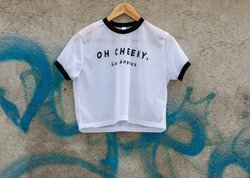 This cute cropped women’s tee from charitable apparel company Oh Cheeky will ensure that one of your vulnerable neighbors receives a care package of essential items such as socks, antibacterial cleanser, SPF lotion, hygiene products, and feminine care products. The package will also include a personal message from none other than you! 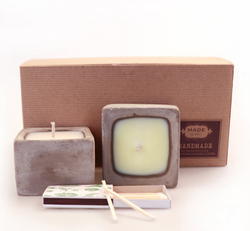 There’s nothing more festive than this fir and fireside gift set, which will help the Downtown Women’s Center provide job training and employment for women transitioning out of homelessness. You can order gifts like this one online or hop in to the MADE by DWC Cafe & Gift Boutique for some coffee and shopping. While you’re at it, get a little something for yourself from the MADE by DWC Resale Boutique. This his or hers luxury bag will ensure that one LAUSD student in need receives a backpack from Operation School Bell. 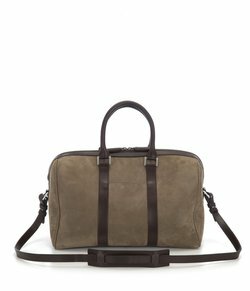 It’s a BOGO that will bring joy to two people, and if the bag gets used for good...to many more. This stunning piece was made by Hilda, one of the many skilled artists fostered by the organization Piece by Piece. 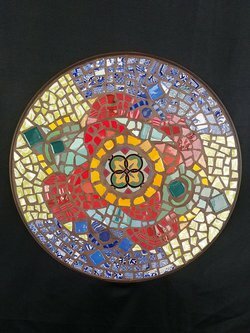 A portion of proceeds will go towards free mosaic art workshops that help neighbors like Hilda who live in supportive housing units to develop marketable skills, self-confidence, earned income and an improved quality of life. 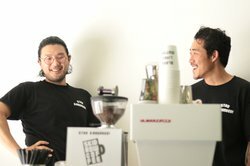 This trendy new Pasadena coffee shop provides a barista employment training program for youth who are experiencing homelessness and helps them transition into full-time employment. Oh, and its suuuuper cute. 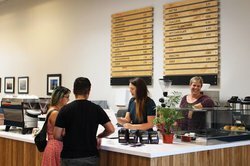 This downtown pop-up coffee shop donates 100% of proceeds toward helping people experiencing homelessness transition back into the housed community. That includes job training for their own shop! 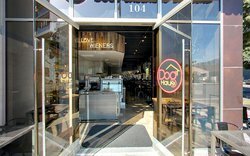 Dog Haus creates special charitable items for their menu, and $1 of sales from each of these special items goes to the charity No Kid Hungry. Guess what they sell. Pizza is the ultimate post-shopping chow down. 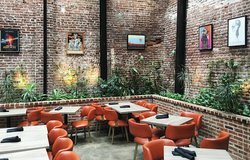 This cool Echo Park restaurant gives $4 from every pizza they sell to local charities like the Skid Row Learning Center. 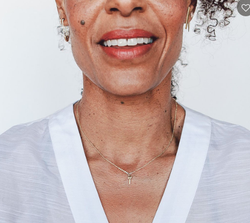 If you’d like to become more involved in helping our neighbors who are experiencing homelessness, consider joining United Way of Greater Los Angeles’ Everyone In™ coalition or make an end of year donation to United Way today. Happy Holidays!